The November edition of Tabletalk is out. 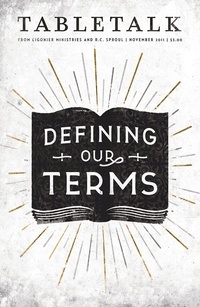 This month’s issue seeks to unpack the biblical-theological meaning of certain words commonly used in Scripture that, nonetheless, remain either largely misunderstood or not fully understood among laymen. These include Amen, Blessing, Church, Covenant, Glory, Heaven, Kingdom, Loyal-Love, and Worship. Contributors include R.C. Sproul, John Piper, Derek Thomas, Michael Horton, Carl Trueman, Kevin DeYoung, Donald Whitney, and R.C. Sproul Jr.
“God’s Hammer” by R.C. Sproul Jr.